If you are looking to start a career in the financial sector, it’s worth making sure that your Curriculum Vitae is up to scratch. 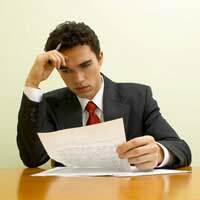 Here are a few suggestions as to how to fine-tune your CV for a job in finance. The job market for the financial industry is not as strong as it used to be, which means that competition for places is fiercer than its ever been. With high competition for every role, and hundreds of candidates after the same job, it is important to get your foot in the door and be asked to attend as many interviews as possible. To do this, you need to make sure that you have a CV that is professional, attractive to potential employers and an acceptable standard for the financial industry. Think about the process from the company’s point of view. If they receive 200 or more CVs for a single role, they will want to trim this selection down to a more manageable number for interview, which will be between, say, 10 or 12. This means that they have to be ruthless and bin a large proportion of the CVs that simply don’t look professional enough or will take too long to get through. They’ll start by throwing out those that are illegible, that are longer than three pages, those that are written in an essay style instead of using bullet points, and those where the skills and individual profile aren’t shown on the very first page. After the first cull is complete, they’ll start to actually read the CVs that are left! The next step will be to weed out those were the applicant does not have the required skills or qualifications for the role. If your CV has made it through to this stage, then you are doing well – but the hardest part comes next. Here’s where the value of a well-written CV will be of greatest benefit. The employer is looking for someone who will make the selection process easier. This means someone with previous experience that closely matches the role, will require little or no training and has a personality that will be well-suited to the working environment. The expertise section needs to be brief and relevant, and is best laid out using bullet points. Feel free to use bold type to highlight the words that you think match the job specification. Make sure that you demonstrate a broad range of skills rather than simply focusing on one key area – you should always aim to present yourself as a ‘good all-rounder’ if possible. Remember to also add personal attributes, such as working the ability well under pressure, with examples. Personal achievements are often difficult to put into words, but the easiest way to present them is to think about how they have affected the business that you worked for at the time. For example, have you managed to solve any problems at work that saved the business money? Have you implemented any changes that have significantly helped improve the business? If you think about previous accomplishments that a future employer would also like to see happen in your new rule, then they are worth including on your CV. The second page should ideally be the last page of the CV, and it should be where you list work experience, education, training, and hobbies. Try to keep each section as brief as possible, focusing on the most important aspects (for example, providing details of your degree means you don’t need to focus on your GCSEs). Lastly, make sure that your CV is targeted towards the job you are trying to get an interview for. If the job is a specific role, make sure that it sounds like it has been written exclusively for that position, and doesn’t include vague general terms that will reveal it to be a standard generic application. The job market might be tougher, but there’s no excuse for your CV failing to at least get to the second stage of consideration. Take some care when putting together your CV and you should find the number of interviews you are invited to attend rises dramatically.